Deciding what to do with your pension is an especially important decision, and one that shouldn’t be made lightly. It's important you understand all the potential pitfalls as well as the steps you can take to avoid them. This factsheet is not personal advice. If you are unsure, please seek advice. What you do with your pension is an important decision, which could be irreversible. 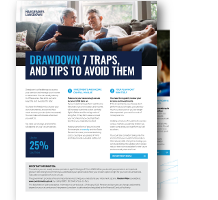 Drawdown is a higher risk option than an annuity. You should check you're making the right decision for your circumstances and that you understand your options and the risks. Make sure you understand your options and check they are suitable for your circumstances: take appropriate advice or guidance if you are unsure.